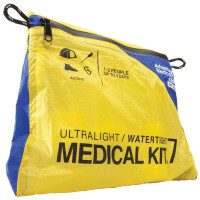 Find the Adventure Medical SOL Scout at First Aid Store™… escape the elements, stay warm, and signal rescuers so you're easy to find. - Broadcast your location up to 10 miles away with the Mini Rescue Flash Signal Mirror and up to one mile away with the 100dB pea-less whistle. - Mini roll of duct tape to repair gear or yourself. - Fire Lite striker is waterproof and tested to produce over 5,000 sparks; - Tinder Quik burns up to two minutes, even when wet. - SOL Survival Blanket reflects 90% of radiated body heat. Survival instructions printed directly on blanket. - Pro-quality RF-Welded dry-bag with roll-down closure keeps contents dry in any conditions. - Button compass to help you get your bearings straight. The SOL (That is Survive Outdoors Longer!) Scout.